Thomas Wilson was the son of James Wilson, a “hallier” and labourer and his wife, Elizabeth who lived in Grovesend Slade and Crossways. Thomas was baptised on 11 July 1830. On 26th October 1848, Thomas joined the 3rd Battalion of the Royal Artillery in Bristol, claiming his age was 20 years. Prior to joining the Army he was a labourer. He was to serve for almost 11 years, being discharged on medical grounds in September 1859. He had been fighting in the Crimean War when he was kicked by a horse on his right ankle, making him lame in 1857. After this accident, he was transferred back to England. Thomas’s discharge papers reported that his conduct had been ‘exemplary’. He had been promoted to “Serjeant” and had received one Good Conduct Badge, and was entitled to another when discharged. He was awarded a Silver Medal for Services in the Crimea and a clasp for the siege of Sebastopol in 1854. The papers also give a full description of Thomas on his discharge – aged 30 years and six months, 5ft 10 inches, dark brown hair, grey eyes and fresh complexion. He was awarded a pension of 10d per day, initially on a yearly basis, but in 1865 this became permanent. On 17 January 1859, he married Anna Maria Camm in Thornbury. Anna was baptised on 4 May 1831, the daughter of Joseph Camm, a carpenter and his wife, Maria who lived in St Mary Street. Thomas placed a notice (shown on the left) in the Bristol Mercury on 19th November 1859. It indicates that he had just started a carrier business between Thornbury and Bristol on Mondays, Wednesdays and Fridays. They had a daughter, Mary Ann, baptised in Thornbury on 21st October 1860. In 1861 Thomas and Anna were living at the house which later became known as 21 St Mary Street. Thomas was described as a Chelsea Pensioner and Carrier and Anna was described as a grocer. A daughter, Mary Ann aged 1 month and Thomas’s brother, James, a cordwainer aged 17 were living with them. On 6th April 1862 they had a son, Charles, baptised in Thornbury. He was buried on 11th December 1863 aged 1 year and 8 months. On 8th May 1864 they had a son Henry Charles, baptised. Thomas took over the running of the Horseshoe following the death of his brother, Ephraim, in 1863. In 1865, Thomas purchased number 21 St John Street from George Wiltshire at a cost of £130. He never lived in this house, continuing to live in St Mary Street, and allowing the house in St John Street to be let to tenants. On 14th January 1866 they had a daughter, Maria, baptised and another daughter, Laura, was baptised on 2nd June 1869. In the 1871 census, Thomas is shown as a beerhouse keeper (employing one man) at the Horseshoe Inn in St Mary Street. In addition to Mary Ann, they now had Henry Charles aged 6, Maria aged 5 and Laura aged 1. A niece, Annie aged 13 was also living with them and assisting in the business. They had two more sons, Joseph Thomas, was baptised on 6th March 1872 and John baptised on 28th March 1875 (when Thomas is shown as a grocer). The 1881 census shows Thomas and Anna Maria still in the Horseshoe. Thomas is described a a grocer and pensioner. They had had two more children since the last census – Joseph Thomas aged 9 and John aged 6. Thomas died on 4th January 1882 aged 51 years. By his will dated 2 January 1880, Thomas Wilson, described as a grocer and beerhouse keeper, bequeathed his estate to his wife, Anna Maria. The Horseshoe was taken over by Thomas’s son, Henry Charles. Anna Maria died on 16 November 1885 aged 54 years. 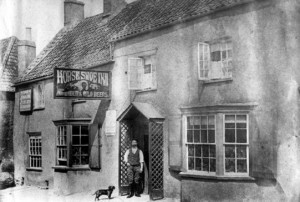 By her will dated 19 October 1885, Anna Maria Wilson, described as being ‘of the Horseshoe Inn in Thornbury’, which is situated on the corner of St Mary St and Horseshoe Lane, appointed her Trustees. These were her brother in law, George Wilson, a wheelwright of 15 Thomas Street, St Phillips in Bristol and Thomas Honeyborne, a butcher from Morton. These Trustees were directed to continue to carry on the business of a public house until her youngest child reached the age of 21 years, if it was a boy, or attain that age or should marry, if it was a girl. They were directed to sell and convert into money her real estate and residuary personal estate, although they could delay the sale until they saw fit. Anna’s will was proved by George Wilson, her brother-in-law and Thomas Honeybourne on 9th February 1886. George Wilson died on 5th September 1892 by which time they had not yet sold number 21 St John Street. It was however sold on 25 March 1896 for £212 10s to Albert Edward Bevan, a boot and shoe maker from Thornbury. Joseph Thomas Joseph was baptised in Thornbury on March 4th 1872. By the census of 1891 he was 19 years old and living with his family at The Horseshoe Inn. He was described as a harness maker and we know from his application to the army that he was employed at Embley’s the saddlers shop in Thornbury. After six years of working as a saddler at Embley’s he enlisted in the Royal Engineers on 9th August 1893. He was aged 21 years and 6 days. He was 5ft 11 inches, 149 lbs with 38.5 inch chest when expanded, fresh complexion, grey eyes and brown hair. Joseph served in Natal, South Africa during the Boer War and was awarded the South Africa Queen’s Medal and South Africa Rings. He was promoted to Sergeant in 1902 and posted to mounted duties in 1903, qualifying as a ‘Superior saddle and collar maker’. Joseph married Clara J Edwards at Aldershot. Clara was the daughter of John Edwards the manager of the U.D.C Works at Aldershot. The 1911 census shows the family living with John Edwards and his wife Jane at the U.D.C. By this time Joseph and Clara had two daughters. They went on to have two more daughters and two sons. Joseph extended his service and continued through to the First World War. He was discharged from the service following completion of his second period of engagement on 5th August 1916. Joseph died in 1948 and was buried in Surrey. Henry Charles – Henry was listed as being a member of the Thornbury Volunteer Rifles in 1886. He had taken over the running of the Horseshoe Inn in 1885 following the death of his mother. The 1894 Rate Book shows Henry Charles had left the Horseshoe and it had been taken over by his brother-in-law, William Charles Underhill, the husband of his sister, Laura. In 1895 Henry Charles married Kate Coggins in the Bristol area. The 1901 census shows Henry Charles and Kate living in Park Lane, Chippenham. Henry was a carpenter and joiner aged 36, Kate seems to have been a widow. As Kate Elson she married Daniel Isaac Coggins in Bedminster in 1887. They had a daughter, Frances Kate born in 1888 and a son, Ernest Daniel born in 1890 before Daniel died in 1890 aged 27. In 1901 Henry Charles and Kate were living with Frances and Ernest and two children of their own: Gladys aged 3 and Thomas aged 1.